Skywatcher Bruce Gary's image of Comet ISON, taken on the morning of Aug. 12, 2013. Gary, a retired radio astronomer and atmospheric scientist, photographed ISON from his Hereford Arizona Observatory with a Celestron-11 Schmidt-Cassegrain telescope. ISON, which almost immediately after its discovery last September was branded as a "comet of the century" candidate, now seems in jeopardy of completely disintegrating before skimming just 724,000 miles (1.16 million kilometers) above the surface of the sun on Thanksgiving Day (Nov. 28). 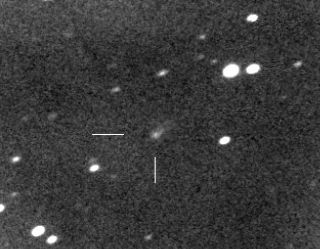 Early on Monday (Aug. 12), Arizona amateur astronomer Bruce Gary became the first person to pick up Comet ISON since it disappeared in early June. By stacking images acquired by an 11-inch telescope pointing just 6 degrees above the eastern dawn horizon, he succeeded in recording a fuzzy patch of light with a short tail at the comet's predicted position among stars that are as faint as magnitude 16. “That the comet continues to appear as faint as it does implies that its intrinsic brightness (absolute magnitude) is low and that the nucleus is probably small and relatively inactive," said well-known comet observer John Bortle. Bortle added that, in his opinion, "ISON has no chance of surviving its perihelion, based on my paper 'Post-Perihelion Survival of Comets with Small q' (International Comet Quarterly, Vol. 13, No. 3, July 1991)." In light of this, Bortle stresses that he is hedging his bets: "I wouldn't fully commit to such until I see some actual visual observations reported."